When AirPods were first unveiled back in 2016, I thought they looked kinda funny. We all remember the jokes. The case looked like dental floss. The earbuds looked like mini toothbrush heads sticking out of your ears. How you’d need courage to dare to wear them in public. We weren’t used to the idea of tiny little white earbuds sticking out of our ears with no chord attached. While I thought the focus on comparing the AirPods design to dental floss and toothbrush heads was a little overblown, I honestly felt that if I were to wear them in public, I would be pretty self-conscious. Forget about cool — they weren’t even socially acceptable. Fast forward two years later, and I see them just about everywhere. Despite costing over $200, significantly more expensive compared to the standard $35 Apple EarPods that come in the box with an iPhone, it’s starting to feel like the same little white wireless earbuds that everyone made fun of two years ago are starting to become the norm. What I found even more interesting was how people kept talking about how much they absolutely loved their AirPods. This had me both sceptical and confused. Look, despite the perfectly reasonable arguments that the standard EarPods are overpriced and don’t sound all that amazing, I actually really like them. I think they sound much better than the previous generation Apple earbuds, but more importantly, they just fit my ear better than any other earbud I have ever tried. (For some reason, I have just never found in-ear headphones comfortable, even high-end ones like Bose). So I just assumed that AirPods were basically the exact same thing as the EarPods I already owned, except without the chord. How much of a difference could that make? Being able to listen without having to be tethered to my phone turned out to be a lot more liberating than I expected. I can go to the gym and not worry about moving my phone around for every different exercise I do. I don’t have to decide between holding the phone in my hand as I run, or placing it in the cup holder of the treadmill, while I precariously try to make sure my hands don’t accidentally get caught in the chord and send the phone flying. (Despite always being careful, I’ve done this at least twice). Instead, I just pick my workout playlist, set my phone in a safe spot, and then just go about my business without giving much more thought to where my phone is or what wires might potentially get in the way. In fact, this freedom, this idea of not really thinking about a chord or worrying about having to keep your device close to you to stay connected, is really the most magical part about using wireless headphones for the first time. I often find myself just setting my phone down somewhere in my house and then just listening to my music (or podcast or audio book) of choice. I might be studying in my bedroom, have to get up and go to the washroom, and then go to the kitchen for a drink of water. I don’t have to worry about bringing my phone with me everywhere, which means I’m spending less time checking notifications, opening Twitter, or otherwise just mindlessly playing with my phone. This has also been helpful for my sleep routine. Before, if I wanted to listen to something before going to sleep, I would have to bring my phone into the bed with me. A couple of times this meant I woke up to find my phone wedged somewhere underneath me because I fell asleep and forgot to put it back on the bedside table. But worse, it meant easier access to checking my phone just one more time before shutting off. Okay fine, one more time after that. Next thing you know, I’ve read a couple interesting articles on Medium and now my brain doesn’t want to shut off. Now, I just put on my AirPods, play my music/podcast/audiobook/whatever, put my phone somewhere out of reach (and usually plugged in to the wall so it can charge overnight), and close my eyes. When I’m ready to go to bed, I just take them out, the sound pauses, and then fall sound asleep. Now, everything I just said is technically true of any wireless headphones. So what makes AirPods so special? Well, there are the obvious answers, like the “holy crap this is so painless I wish all Bluetooth devices connected like this” pairing experience the custom Apple W1 chip provides. When I bought the AirPods from the store, I think I spent more time opening the plastic wrap and the packaging than actually pairing them to my iPhone. Once I opened the box they came in, I flipped open the lid of the case (yes, the one that looks like dental floss), held it close to my phone, saw a prompt appear, and tapped a button. That was it. I then placed each earbud in my ear, and immediately the music from whatever song was playing to my old wired earbuds just 10 minutes earlier started playing again. There are very few product first experiences I’ve had that I would describe as “magical.” This was one of them. We often think of “smart devices” as things like smartphones or smartwatches and marvel at how powerful and smart computers have become in such small form factors. However, we usually don’t think of our headphones as being either smart or a computer because, well, they usually are neither. With the old wired earbuds, you can control the volume, play/pause a song, skip forward/backward, and activate Siri. That’s pretty much it, and everything it does is in response to you (a human) telling it what to do. It doesn’t do any thinking on it’s own, because, well, it doesn’t really have to. Wireless earbuds on the other hand have a few more things to be concerned with. Are they connected to the right device? Are they within range to maintain the Bluetooth connection? How much battery is left? How do you charge them if they run out of battery? Is the audio playing to both the left and right earbud in sync? How much latency is there over wireless? What happens if only one earbud is in your ear? AirPods answers all of these questions in the most intelligent way I can think of — as a user, you don’t really have to think about it at all. It just works. Instead of having to remember to press play or pause when you put in or take them out of your ears, there are sensors on each earbud that are smart enough to figure out what you’re trying to do. Take a single AirPod out of your ear? It figures maybe you’re trying to talk to someone, so it pauses whatever is playing. Put it back in, and the audio resumes, because that’s probably what you’d want it to do. If you want to listen to music with just one earbud, it’s smart enough to know you’re only using a single AirPod, so it automatically converts stereo sound into mono for a better listening experience. Running low on battery? That same dental-floss case is what charges your AirPods, so you never really run of out juice as long as you put them back in the case when you’re done. Simple, intuitive, and it just works. It’s Apple at its finest. Since everyone’s ear is a slightly different shape, experience with how any particular earbud fits in your ear is going to be a personal one. I mentioned earlier how I’ve always loved Apple’s earbuds because they always seem to fit me better than anything else, and I’ve just never found the in-ear style comfortable. What I did not expect was the combination of not having the chord and the slightly tweaked earbud design would lead to maybe my favourite part of the AirPods. When I’m wearing them, I honestly forget they’re even there. The following is a true story. I came back from hockey one night. It was late, I was exhausted, and I was hungry. So I put my gear away, found something to eat, then went to take a shower. After I got out, dried myself, and went to comb my hair in the mirror, I froze. Oh my goodness, what did I just do, I thought. I had kept my AirPods on the entire time I was in the shower, and didn’t even realize it. Naturally, my first instinct was to panic, and was sure I had just damaged my brand new $200 earphones because I had not just gotten them a little wet, but had literally taken a shower with them. I dried them off as best I could, and stuck them in a bowl of rice. I then Googled “can you wear AirPods in the shower” fearing the worst, but was surprised to see this community of people on Reddit who apparently swear by taking their AirPods into the shower with them every day, even though they are not officially rated as water resistant (and Apple has been very clear never to claim they are). Luckily for me the AirPods survived this ordeal without any damage whatsoever (and I didn’t have to make a really embarrassing trip to the Apple Store). Whether you think it’s impressive they survived a trip to the shower or think I just got really lucky (for the record I still don’t recommend taking AirPods with you in the shower so don’t try this at home), for me the big story here is how this even happened in the first place. I wasn’t even playing music — they were just in my ear because I had forgotten to take them out, and then didn’t even notice until I looked at a mirror. This never would have happened with the old wired earbuds, over-ear headphones, or — I’m willing to bet — any other wireless earbuds. The chord connecting your device to wired earbuds makes their existence obvious and fairly hard to forget about. Even if the actual earbud fits perfectly in your ear like the EarPods did mine, every time you move your head too far in one direction, you’re reminded of the chord’s presence by its tug against your neck. With over-ear headphones, even if they are wireless, by definition they are just so much bigger and heavier that even if they are very comfortable, you still feel and notice them sitting on your head. But with AirPods, there is just something about the combination of not having a chord, how they fit in my ear, and the slightly tweaked earbud design that keeps the stick part flush to my face, that makes me forget there is even anything in my ear in the first place. And when I’m actually listening to music, that design translates into it feeling like there is music playing straight into in my ears, and I forget about how. The device just disappears into the background. Again, one of those magical experiences. If you couldn’t tell by now, I really, really like my AirPods. I even find myself sometimes picking them over my comfortable and better sounding wired headphones in the office because I just don’t want to give up the convenience. But it doesn’t mean AirPods are perfect, and while there isn’t anything I seriously dislike about them, there are a couple of small things that I did want to talk about. The first is having to double tap your ear to change the volume, and only being able to do this by asking Siri. I don’t mind the double tap gesture in and of itself — I think it’s fairly intuitive and makes sense — but I always feel like I have to tap on my ear harder than I’d want to for the gesture to be recognized. It’s not that it hurts, but for me at least it doesn’t feel the most comfortable. My thoughts on using Siri to do things is the topic of an entirely separate blog post, but before I started using AirPods, I thought the inability to adjust the volume through any controls other than asking Siri was going to be a huge annoyance for me. And while it can definitely still be annoying, I found I didn’t really need to change the volume directly from my AirPods as often as I thought, and the times that I do, I’ve started to get used to asking Siri to raise or lower the volume (although I always feel weird asking her in public and try to avoid doing so as much as possible). The second is related to one of my favourite features of the AirPods, which is they intelligently pause audio playback when you remove just one of the earbuds from your ear. There are enough real world scenarios where once I’ve taken out the earbud, I have to decide what to do with it. Do I just keep holding it in my fingers? Do I put it in my jacket pocket? My pants pocket? These seem like logical options, but I’ve found that sometimes putting an AirPod in your pocket will trigger the sensor, making it think it’s actually in your ear, and then start playing audio again. I’ve resorted to usually placing it in my front pant pocket but with the earpiece part sticking out, so that the sensor doesn’t trigger. Now I realize I could just keep them in my ear and pause the audio playback manually on my phone, but for social situations like ordering takeout or paying for groceries at the checkout, I like taking out my earbuds as a basic courtesy to signify to the other person yes I can hear you and yes I am actually listening. This is maybe the only thing I miss about the old wired EarPods, as I could quickly and in one motion just take them out of my ear and swing them around my neck to rest. One of my big concerns with buying these was would they fall out of my ear while going for a run. As much as I liked EarPods, and while they were generally okay at staying in my ear during a run, I would normally have to readjust them or put them back in a couple of times per run. Now since there was a chord, I wasn’t concerned about losing them, it was just annoying to fiddle with them while still running. With AirPods, I was scared I might lose them, and they are not cheap to replace. I was pleasantly surprised then to find they actually fit much better in my ear while running (I have not had a single earbud fall out even once), and counterintuitively, the reason they don’t come loose is apparently because there is no chord to constantly tug at them. When I first bought my AirPods, I had expected it to take some time to get over the social awkwardness I would deal with while wearing these. However, within a couple days, I stoped caring if other people thought they looked kinda funny on me because of how convenient they were. I’ve since decided that AirPods have become socially acceptable enough that I now don’t even think twice about wearing them in public. I did find the max volume on the AirPods to be about one “bar” of volume quieter than the EarPods, and for someone like me who tends to listen to their music fairly loudly and who takes transit every day, it was a concern for me initially. However, I’ve started to become used to not playing my music at a really high volume all the time, which in hindsight is probably a good thing. I found the Bluetooth range to be incredibly impressive. The office where I work is approximately 4000 sq ft, and the AirPods had no issue maintaining connection to my phone no matter where I went. By most metrics, the AirPods have been a huge success for Apple. They are an industry-leading product, people really love them, and they account for a majority of the wireless headphones market share. 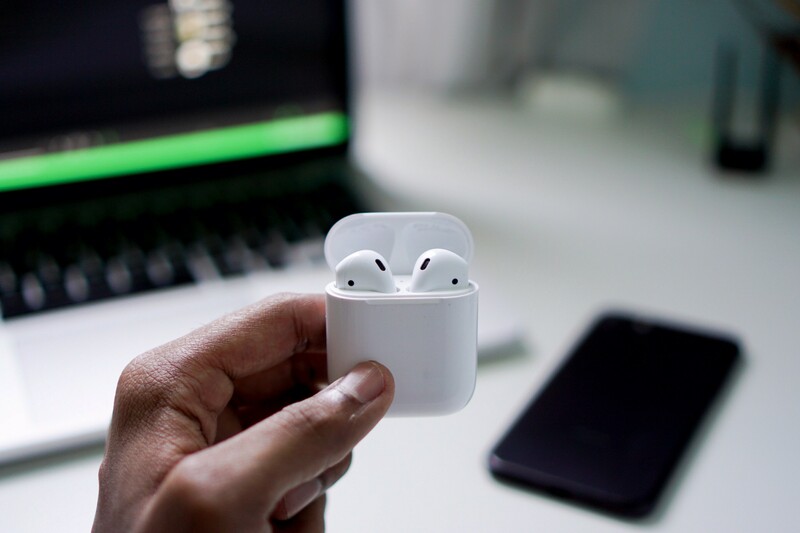 Some have even called AirPods Apple’s best new product in years, which is saying something given that products like the Apple Watch and iPhone X have launched within the last few years. With such a successful first version, and being such a fan of them myself, what am I hoping for in version 2? For starters, when it comes to battery life, Apple claims AirPods last up to 5 hours for music playback. While the battery life isn’t bad by any means for such tiny wireless earbuds, and the case charges them ridiculously quickly (something like 40% in just 10 minutes), it would be nice to get a little closer to that “all day” battery of 7–8 hours. I think it would go a long way to further enhancing the “don’t have to think about it” aspect, as there have been a few times where because I forgot to put them back in the case throughout the day, they had run out of battery before I got back home. Even worse were the few times I forgot to bring home the case itself. Every new generation of audio device seems to improve the audio quality at least somewhat, so that is something I expect to be true of AirPods 2 as well. While I’m no audiophile, I think they sound pretty good already — somewhere between as good as the EarPods to perhaps slightly better. That being said, better sounding earbuds would be something that would benefit everyone. Despite my accidental shower episode implying that these things might be more water-resistant than advertised, it would be nice to have official water-resistant or water-proof certification. Apple’s been able to do it with speakers on the iPhone, so I feel confident they can do the same with AirPods if they wanted. Lastly, while it seems like almost everyone is expecting noise cancellation to be an obvious feature in the next version, I’m not so sure myself. Having never owned noise-cancelling headphones, I do think it would be something I’d enjoy, but I don’t know if it would be worth the battery life trade-off. Although knowing Apple, if they ever did bring noise cancellation to the AirPods, the battery life would at worst be the same as before.